This is a review of Thornton & Ross Mycota foot cream and powder. 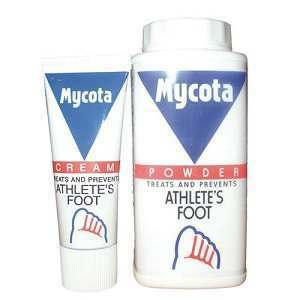 The manufacturer claims that this product is effective for both the treatment and prevention of athlete’s foot. This treatment is supposed to be effective and offers a combination of a cream and powder treatment. In order to successfully use this product, one is required to use either the powder on its own or the cream in combination with the powder on a daily basis. Read on to find out how well this product really works. The active ingredients are zinc undecylenate and undecylenic acid. Undecylenic acid is a fatty acid that prevents the growth of the fungus that causes athlete’s foot. Zinc reduces the swelling and irritation caused by this fungus. For the treatment of an active athlete’s foot infection, the manufacturer indicates the application of both the cream and the powder to the affected area and the immediately surrounding area twice a day– morning and evening. This application should continue for one week after the symptoms of the infection have subsided. For the prevention of athlete’s foot, it is recommended to either apply the powder once a day or to apply both the cream and the powder on a daily basis. The use of this product may cause skin irritation, including redness and itching. A serious allergic reaction to this medication is possible, although rare. Symptoms of an allergic reaction include a rash, itching or swelling of the face, tongue or throat, and difficulty breathing. In a study conducted on the active ingredients in this product that included 151 patients, none reported side effects. However, please note that this product contains perfume, which may increase the risk of an allergic reaction in patients who are allergic to ingredients found in perfume. You should contact your doctor immediately if you experience any possible symptoms of an allergic reaction. A 70g tube of Mycota powder is available online for ￡3.49. A 25g tube of Mycota cream is available online for ￡2.49. No other products containing these ingredients are listed. The price is about average when compared to other products that claim to treat athlete’s foot. Some customers have reported that this product is difficult to find in stores, but it is easily available online. The manufacturer does not offer a guarantee for this product. Since this product requires a prescription, in the case of lack of effectiveness, you may want to pay another visit to your physician for an alternative option. Customer reviews of this product are generally positive, reporting almost immediate relief of itching and an improvement of the infection in a short time. Customers have also reported this product to be significantly more effective than other similar products. However due to lack of a solid money back guarantee and the low concentration of the main active ingredients, we still had some questions about the basic quality of this formula. Jimmy Rodriguez	reviewed Thornton and Ross Mycota	on June 23rd	 and gave it a rating of 2.5.